In a previous post, we mentioned the centennial of the birth of beloved Cincinnati vocalist Ruby Wright but Ruby wasn't the only one to enter the world in January 1914 because on the 19th of that month, Mary Wood was born. For folks outside of Greater Cincinnati, the name might not be familiar and yet she had national impact and influence. Mary Wood was born in New Orleans but came to Cincinnati when she was nine years old when her father landed a job at the Cincinnati Enquirer. Her father's gift of wordplay was passed along to Mary and in 1939 she, after working as a secretary for a few years, landed a staff writer job at Crosley radio's WLW and WSAI. As a staff writer, Mary could be assigned a variety of mundane writing chores but her favorite assignment was penning a daily 15-minute soap opera. Her boss's instruction? No matter how bad things get for the characters, they can always get worse! 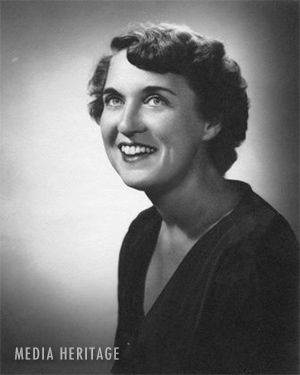 In early 1943, Mary lost her job with Crosley in a salary dispute and was immediately hired by the Cincinnati Post as a city desk and obituary writer. Fortunately, soon after, the paper's radio critic was drafted into the military and Mary was promoted to the radio beat, due in part to her experiences as a radio writer. This began a 35 year career as the radio and television critic and columnist at the Post—longer than any other media critic at one paper in the country. Mary was considered fair and honest by most of the local broadcasters, who honored her in 1973 with a plaque commemorating 30 years in the job. Nationally, just about any big star of TV and radio crossed her pen at one point or another and there are stacks of sincere and personal notes and letters of appreciation from dozens of celebrities over the years. It should be noted that Media Heritage is honored to be the repository of those letters, plaques and photographs. After retiring from her fulltime column in 1978, Mary concentrated on freelance writing and books of her collected columns. Mary was an active and enthusiastic supporter of historical preservation efforts until her death in May of 2002.